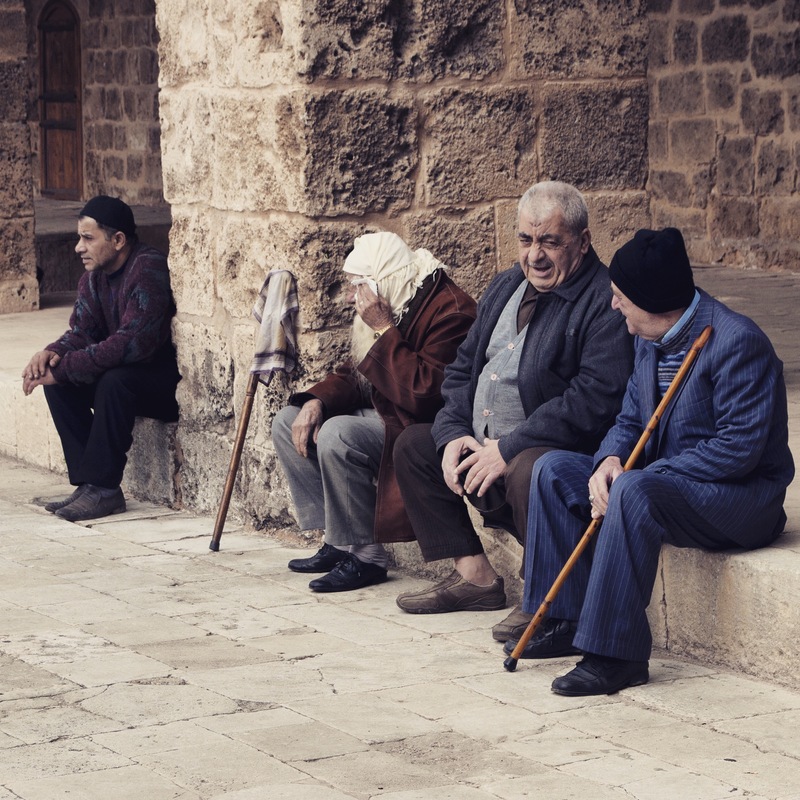 While waiting for the bus to take us there, a few Americans told me about how they had been living in Lebanon for over two years and still hadn’t made the trip to Tripoli. I think I relieved their guilt when I told them that, after 15 years, I had never been either…and I’m Lebanese. After posting a few photos and sharing my trip with friends, their reactions were, “shu akhadik 3a trablos?” (what made you go to Tripoli?). I need justification for going to a place that is a fundamental part of my nation’s history. 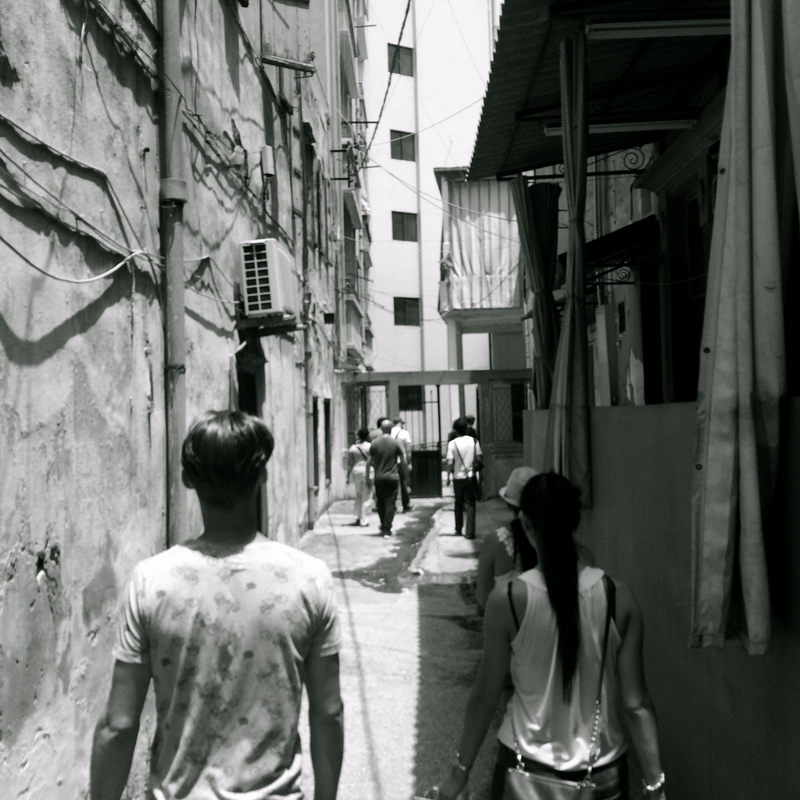 Mira walked us through the old souk, various hamams, and a few khans. Unlike Beirut, Tripoli’s older parts are not mixed with the new ones. 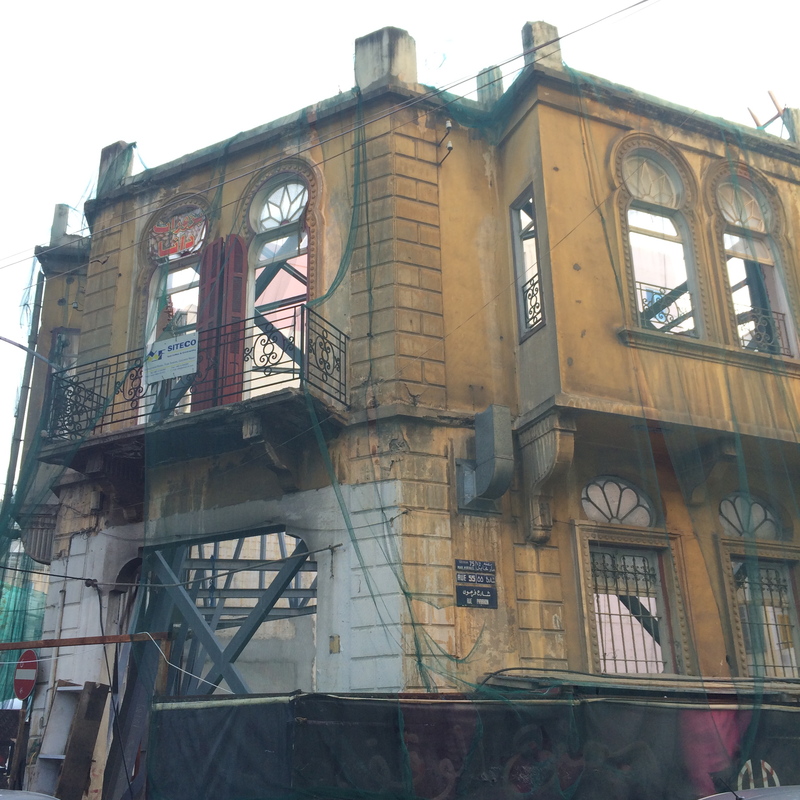 Old and new Tripoli are separated but, like Beirut, its heritage sites are under the threat of development: the site where the Ottoman serail once stood is going to be converted into a parking lot. The old souk itself feels more authentic than that of Byblos which has become more commercialized: catering to the tourists looking for fez hats, belly-dancer scarves with dangly gold coins, and fossil replicas. Tripoli’s souk has yet to be overrun with that sort of merchandise or clientele. The hamams, some renovated and some rotting, are magnificent. Hamam el Nouri, hidden behind a saj place, is aging beautifully. I’m a fan of the way it’s disintegrating naturally. Hamam Ezzeddine, on the other hand, is freshly painted and adorned with roll-up banners explaining each room and process. I do hope that the renovation stays true to its original design but I won’t deny that architectural botox can remove some of the historical spice. When you enter a space that was once occupied by the Ottomans ages ago, you want to feel that. It would be a shame to wipe away the wrinkles, dabbing some foundation on the rough edges should be enough for preservation. Khans, inns with a courtyard, were areas that seemed to be dedicated to one type of craft. Khan el saboun for soap makers, khan al khayateen for tailors, and so on. The soap makers were my favorite. Besides the smells and spirals of colorful bricks, it was endearing watching an old man tell his young daughter where the mint-scented soaps were. It was a family business of craftsmen. I’m a sucker for artisanal families. In a workshop loaded with copper and brass pieces, we found a man hammering away at a bowl. Some artforms are still alive if you look for them. I got a little copper rakweh (Arab coffee pot) for $5. What a steal. Outside of Mzaar Saydit Younes, a small altar dedicated to the Virgin Mary, a veiled Muslim woman was asking a Christian woman about sainthood and differing beliefs. When I see Lebanese people trying to understand one another rather than argue over what they believe in, I am comforted that we are not all sectarian sheep. An Arabic-speaking German woman living in Ras el Nabaa, who previously lived in Egypt, was talking to the table of other Lebanese while she ordered her own hummus. I’m pretty sure we all assumed she’s a spy. That’s just how it is. Hamam el Abed was named as such because an escaped slave from Akkar used it as a refuge before he was murdered there. It’s the only operational hamam left but it’s only for men. Although I want to believe that our Lebanon hasn’t been tainted, I saw ISIS stickers on the plaque of a tomb. Uh oh. New Arabic word: tawashiya means eunuchs. Right now, Tripoli has a reputation for being dangerous so most tend to avoid heading that direction unless they have to. But what was our excuse when things were calmer? Perhaps it’s more about the fear of the unknown. The ripples from terror that affect Tripoli don’t reach our capital city with the strength you would expect. Unless you are from there, what happens in Tripoli might as well happen in Iraq; the reactions are the same. 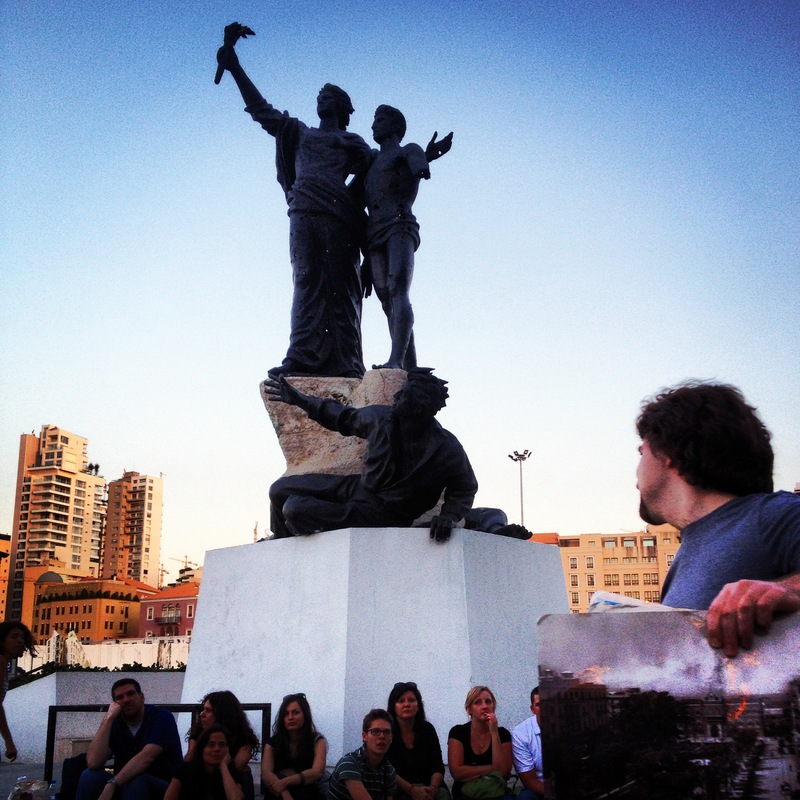 To a lot of the people of Beirut, Tripoli is far, off in the north, almost its own state. In reality, it’s less than a two-hour drive away. Next time you’re there for halawit el-jibn from Abdulrahman Hallab, take a stroll in the city too. Buy a bar of soap. See Lebanon. 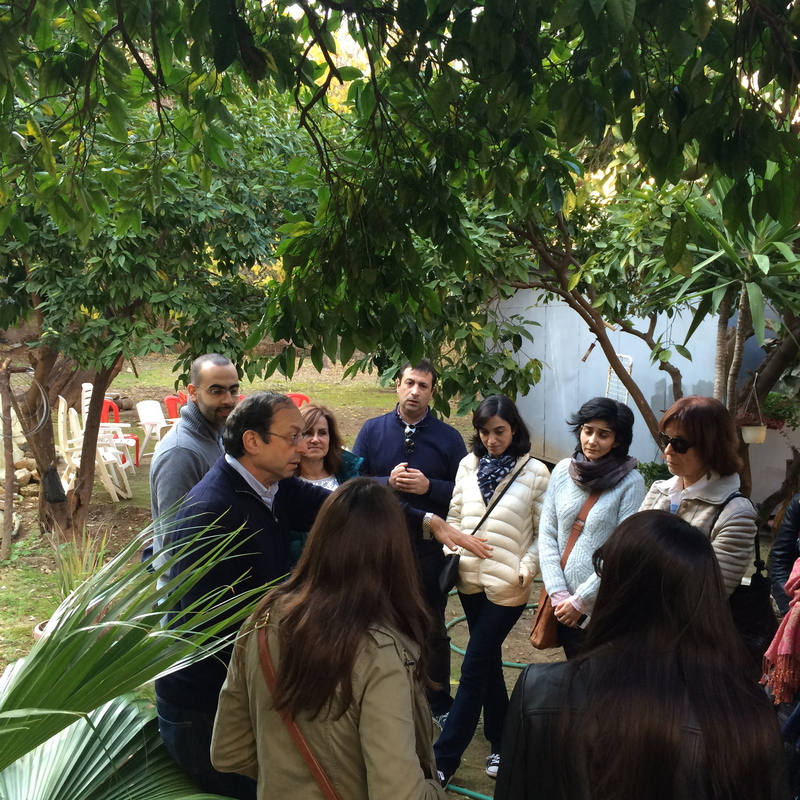 As part of the In Mar Mikhael event, two walking tours were given this weekend. I went along for the afternoon activity this Saturday thinking that I knew a lot about the neighborhood I spend so much time in. Seriously, Google thinks I live in Mar Mikhael because I’m in Ashrafieh (work and play) so much. Turns out, there’s more to this place than I thought. 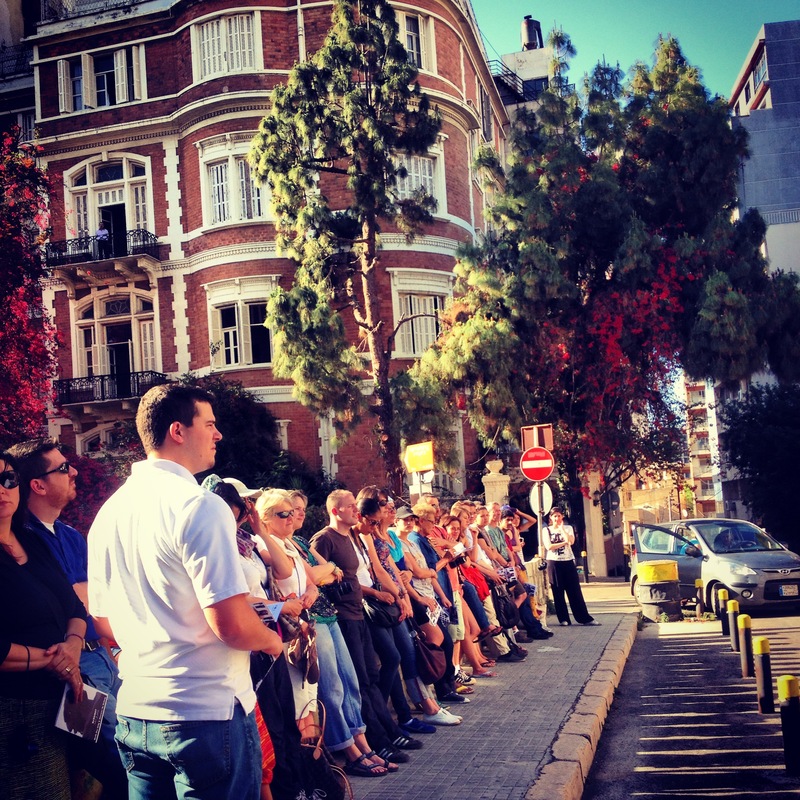 The tour began in front of Electricite du Liban where we were divided into 3 groups departing every 10 minutes. Since I opted for English, Elisabetta was our guide, and started with a brief intro about the Brazilian-influenced EDL building. 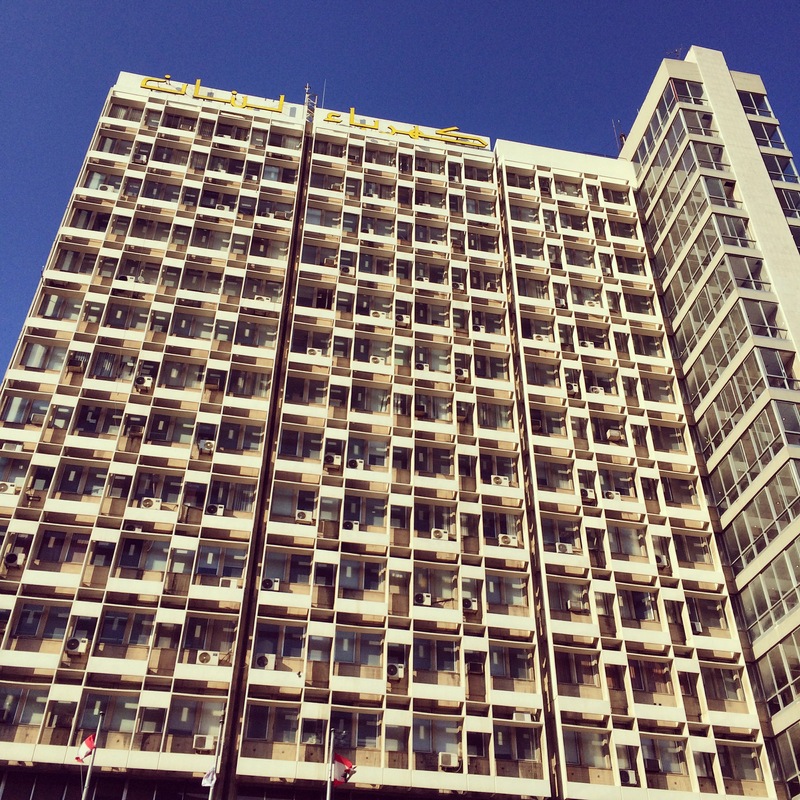 It was built in the mid 1960s, designed by a Lebanese architect, Pierre Neema. From EDL walking toward the rest of MK, there is a new geometric modern building with a green wall on one side, home to Gallery Tanit. This building is the only one that respects urban law because of the existence of a sidewalk. Most developments disregard this and it results in what I call “l’extinction du trottoir,” leaving us to navigate between parked cars hoping we’re not pummeled by a service driver. From this spot, you can see the three different forms of architecture found within MK: 60s, modern, and classic French. Across from this mammoth is an old house of two architectural styles conjoined with a common stairwell, a practice that shows there used to be consideration for economy of space. Behind these lovely old homes is the Tobbagi Gardens, a private space that is open to public visitors. It’s made up of terraces and planting areas and is the biggest green space in MK. Sadly, the gardens are now at risk. If the Fouad Boutros Highway Project is implemented, the gardens will be destroyed; the neighboring building next to Mr. Tobbagi’s has already been expropriated. The only other green space in MK which is across the road has also been bought and will soon be gutted & developed. Besides the fact that these buildings are solid representations of our heritage but are being knocked down like stacks of Jenga pieces, the Project’s urban planning is outdated, inefficient, and unwanted to begin with. For now, the Project is on hold because of the local and international media coverage but no one knows how long that will last. The walk continued to the colorful Massad stairs that were featured on Vogue.com the other day. This staircase, painted by the Dihzahyners a few years ago, are semi-private semi-public and the place where a Save Beirut Heritage sit-in was organized. I hate to say it but the stairs have undergone a lot of weathering since their first coat of paint. 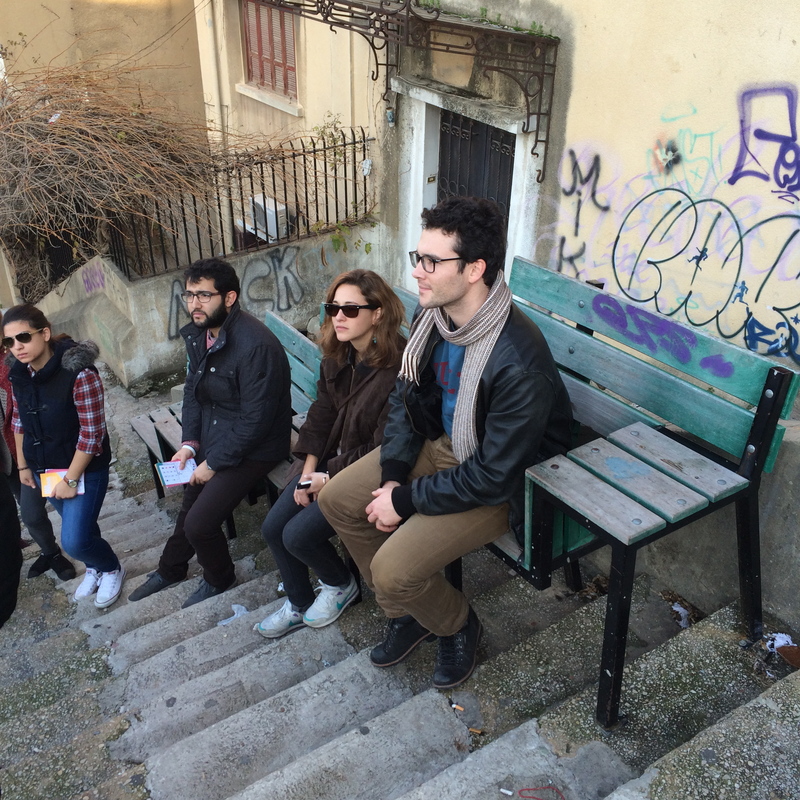 Besides being a site for activism and artistic expression, the stairs also serve to connect the residents of upper Ashrafieh with Mar Mikhael. For example, St. Georges Hospital employees and visitors can use it to jump into a bar for happy hour after a long week since the hospital sits up the street from the top of these stairs. Be careful at night though; sometimes there are punks chucking eggs at unsuspecting pedestrians below. 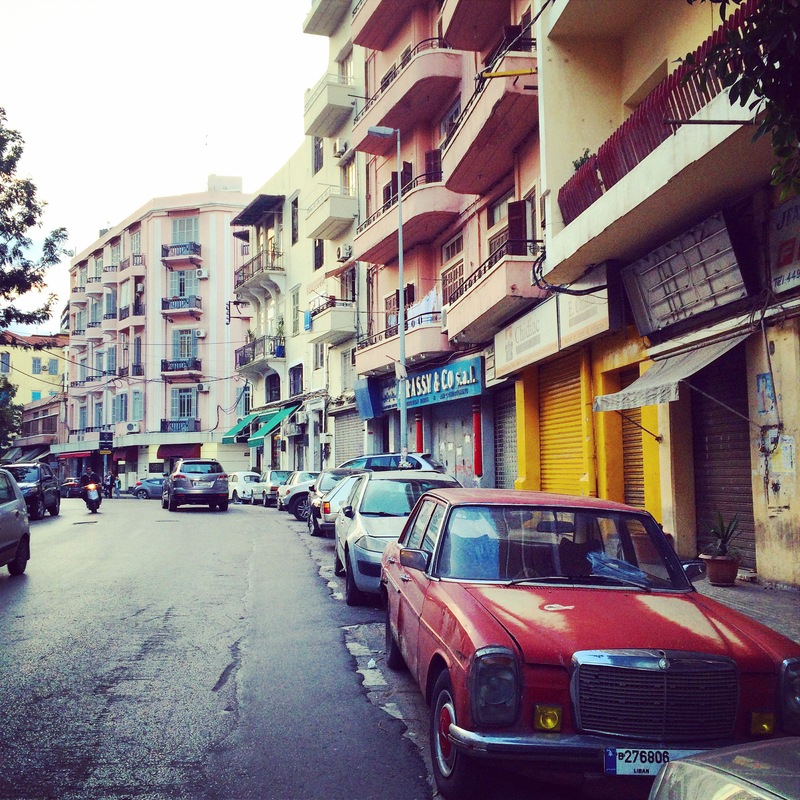 Mar Mikhael used to be a predominately Armenian neighborhood. In the 1920s, the Armenian population shifted over from Qarantina and still make up a big portion of the residents living there now. The area is in full gentrification with the arrival of the new generation who are transforming Mar Mikhael into a bustling creative hub. 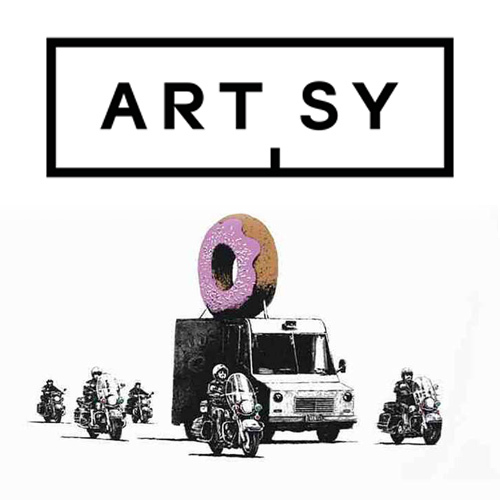 Of course, with them comes the gastropubs and boutiques that the artsy crowds with purchasing power attract. 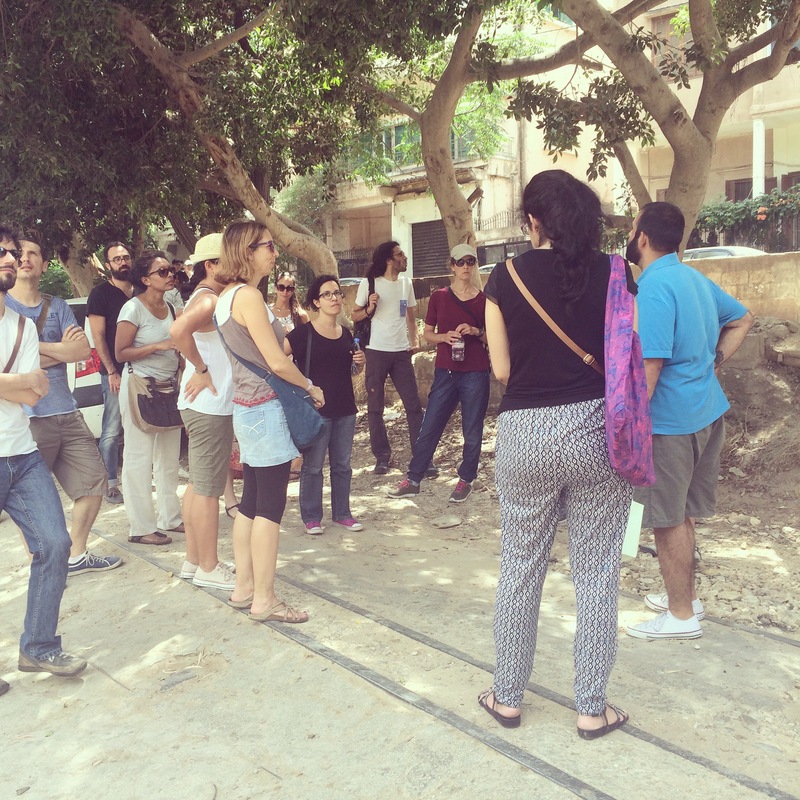 The walking tour’s sole purpose was to show us that Mar Mikhael has different facets but it was originally a residential village. If you walk into the alleyway where Vanina has opened its first shop, you can continue into an open courtyard of neighbors that still live like the days of old MK. Some buildings have been restored (mainly to be home to new restaurants like Les Fenetres) but the majority of property owners find it easier to sell than to salvage and/or fight the developers. That, and it’s more profitable for them on a personal level. We popped out from the Les Fenetres entryway to walk down the Internazionale alley. 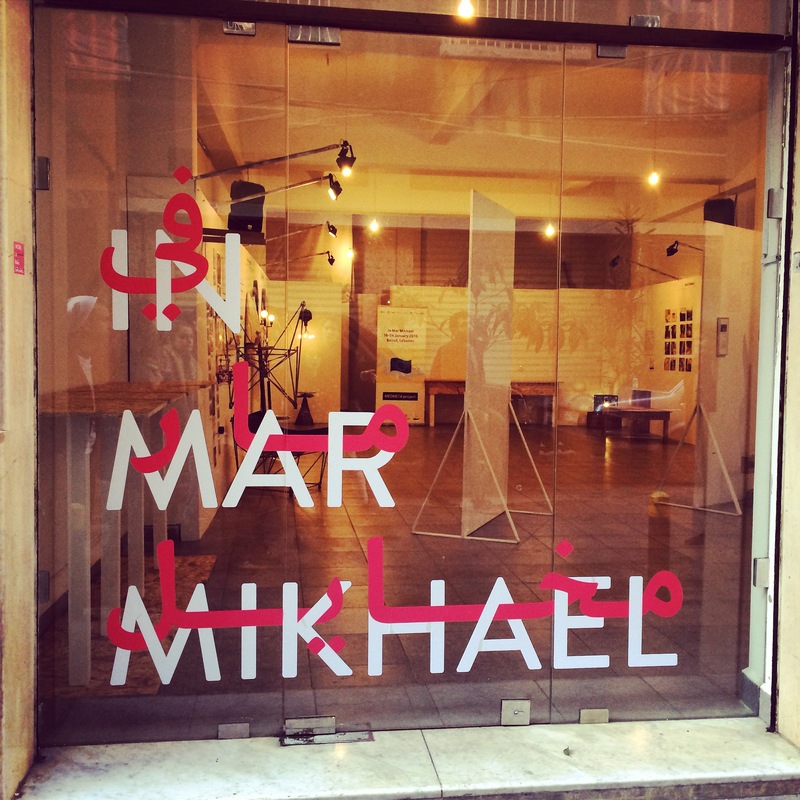 Nasawiya’s old location is where In Mar Mikhael is having their Behind the Object exhibition till the 24th of this month. After making this quick stop, we walked down to Pharoan St. Don’t feel bad if you have no idea where this is because I didn’t know it had a name either. Pharaon St. is the street where PaperCup and Frosty’s Palace are. 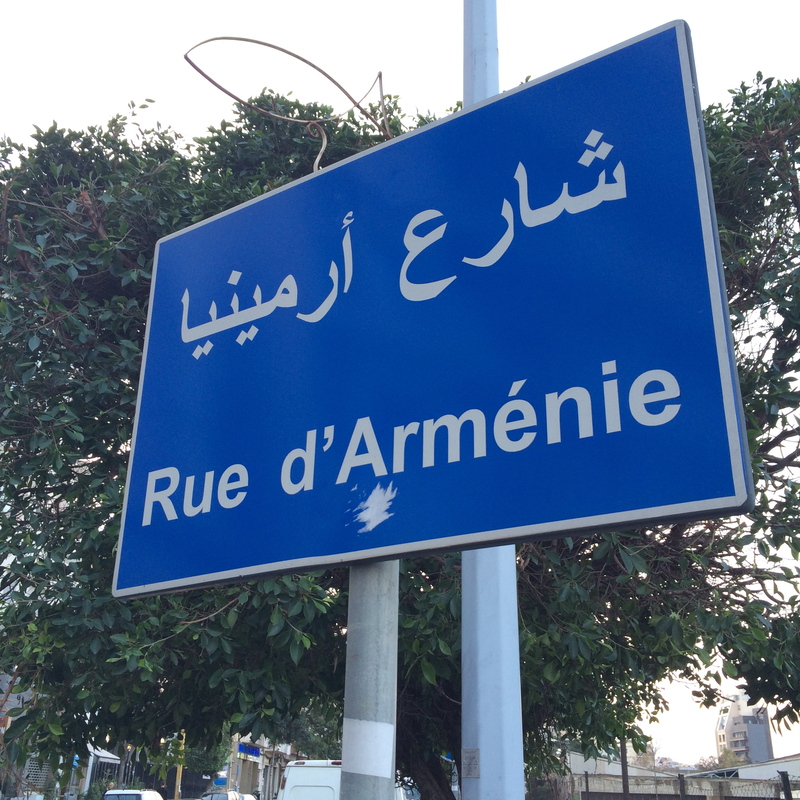 If you’ve ever been to Mar Mikhael, you probably know which street I’m referring to now. If not, you should check out both places. The owners are sisters. Have a coffee and grab a book then walk across the street to inhale a burger and milkshake. 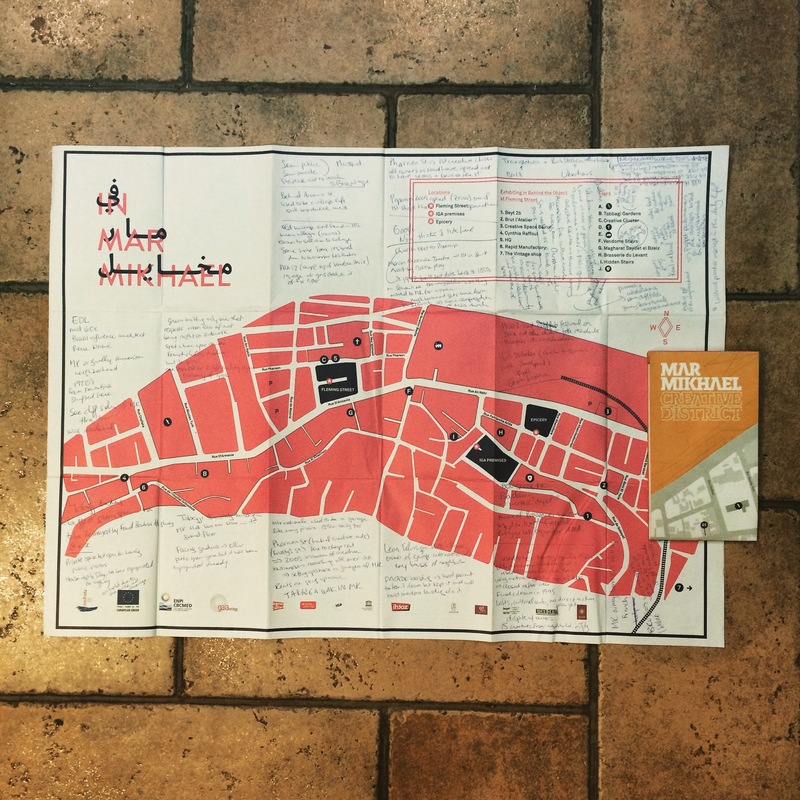 This strip of shops and specialty bookstores make up the “creative cluster” where all owners have made a joint decision that no bars will open on the street there, keeping it quieter than the other crevices of the neighborhood. 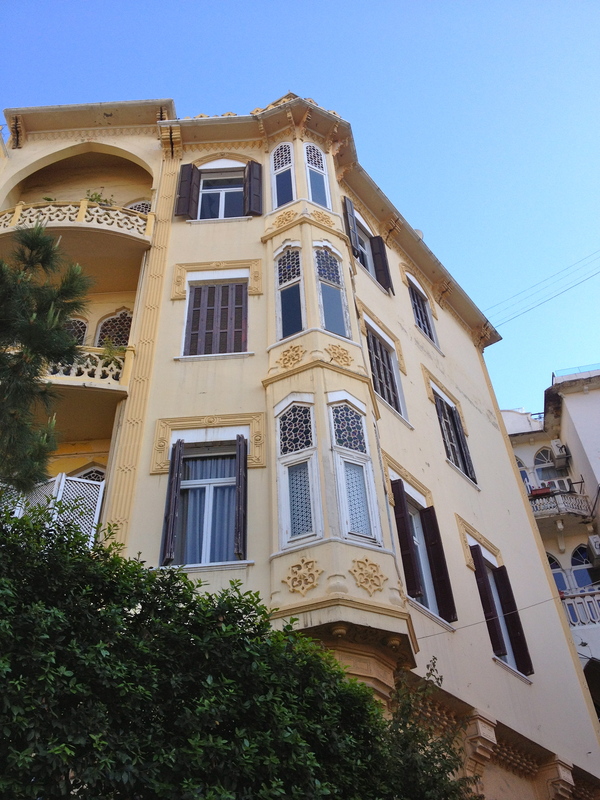 Next to Papercup is the Maroun Naccache Theatre, the first in Beirut and where they put on Moliere productions. The church on the same road is where the neighborhood got its name. The church was originally in Qarantina. The women felt uncomfortable by the presence of soldiers there so they relocated to its current location in 1855 and, like much of Beirut, it was destroyed then reconstructed several times to make it bigger. The last works date back to 1972 and it has been the main place for community congregation ever since. Mar Mikhael is also home to one of the main train stations that was used when we had a railway that ran along the coast to the north. Rather than create museums or public spaces out of relics that link back to our past, it seems we only know how to reinvent our dilapidated public transportation systems into nightlife venues. After the old train station of Mar Mikhael was used for multiple DJ events, it was morphed into a high-end bar by BO18 management. The abandoned bus graveyard/warehouse is Uberhaus’ station for their indoor electronic raves while Garten is closed until the summer. Collectif Kahraba’s Aurelien Zouki met us halfway up the Vendome Stairs to talk about Nahna wel Amar wel Jeeran, the yearly festival that happens there. With a name meaning “us, the moon, and the neighbors,” the festival is comprised of visual/musical performances and public interventions in a public space. Through this, they promote collaboration between different fields who join forces to create a neighborhood event. The collective sees itself as a theatre company that puts on free accessible cultural events that involve the residents of the neighborhood in the planning and whole production. For example, Nawal and Camille, two old neighbors on the Vendome Stairs, participate by composing songs and cooking food for the audience and host guests. Once, a puppet performance was done on the building rooftops; the puppets were based on the known neighborhood personalities like Nawal and Camille. All these attempts at inserting cultural practice into our daily lives is at risk when homes are replaced by towers. The way the community interacts changes because they function like a village. Breaking this dynamic through modern urban development kills the human aspect of the community. One intervention done is the bench found at the halfway point of the staircase. Designed by Christian Zahr, he saw that there was a need for a “break” on the way up the steep climb, especially for the elderly that live in the homes of this part of Ashrafieh. The bench that is built like a staircase itself pokes fun at the fact that there’s no public institution taking care of the residents’ needs or the public space of the city. Located on the Badawi half of the area, the Brasserie opened in the 1930s and was the oldest brewery in the Middle East. It was where Laziza Beer was made. The brasserie as “La Grande Brasserie du Levant” was closed in 1995 but an entrepreneur used it to produce a beverage at a later stage. With little success, it finally closed in 2003. There have been talks to transform it into lofts or a cultural center but no official decision has been made due to a dispute between the owners. This was where GAIA Heritage held an exhibition last July featuring the work of 15 creatives. Across from the Brasserie is a colorful staircase leading back up to an alley by the Vendome Stairs. There used to be a festival there every year until the organizer passed away. 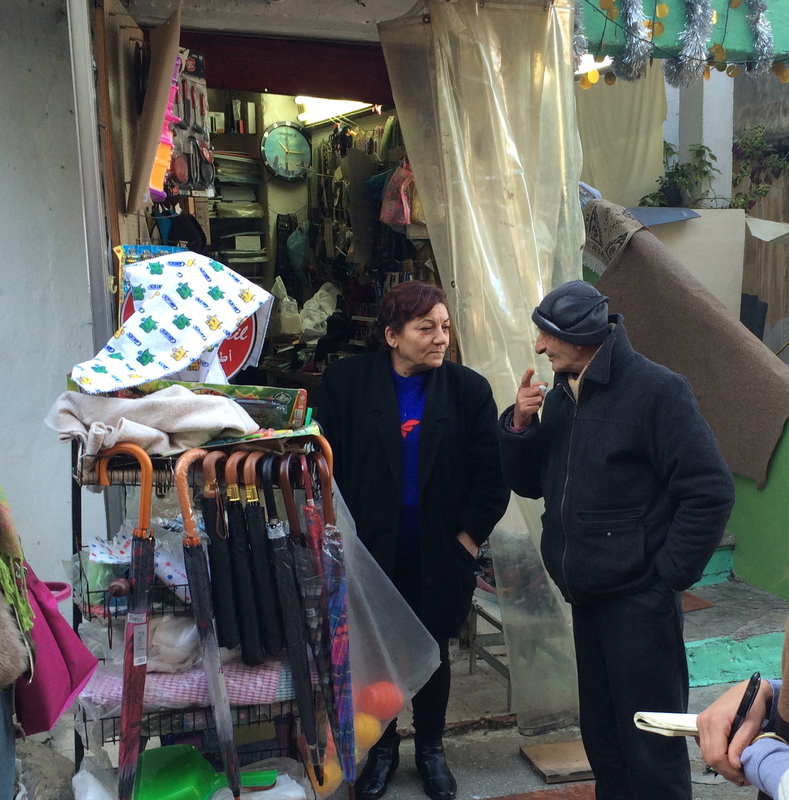 Ronnie Chatah, founder of Walk Beirut, used to run a hostel in Hamra located behind Makhfar Hbeish. He also used to give his guests a walking tour of the city as part of their stay. Back then, the tour would last up to 8 hours. Gradually over time, he was told he had a knack for being a guide to the city and decided to branch out creating an official walking tour open to all willing to spend part of their weekend exploring the city on foot. Walk Beirut has been going for 5 years now; the stops have changed with time depending on the level of relevance of neighborhoods and safety issues. It was initially launched in 2006 but went on hiatus after the July 2006 war with Israel. 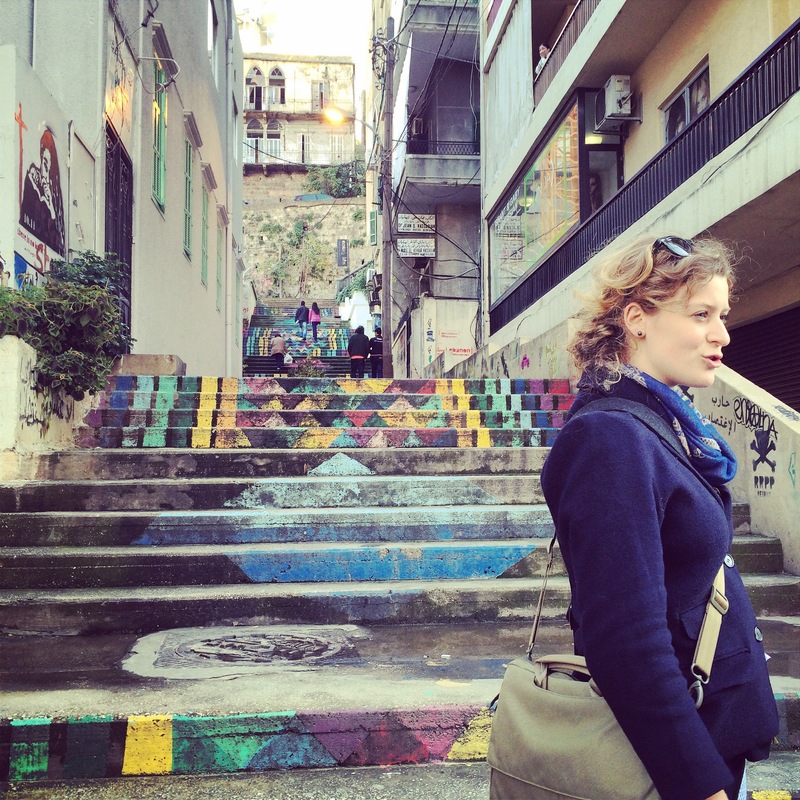 Now going continuously since 2009, Walk Beirut is a great way to reignite the love of your own city or to discover it as a foreigner – even if you’ve lived here all your life. Tours now last around 4 hours and you need to reserve a spot ahead of time (tickets are $20/person). You can find them online here and check out their Facebook group here and I will be posting a mini interview with Ronnie within the next few days. The tour is more like listening to a story about our beloved city with a buried past. Ronnie touches on a lot that is wrong with the country but in an entirely factual manner; a very “it is what it is” bittersweet ode to how the city has been crippled by exterior forces but mostly by itself yet still remains to get under your skin. From the architectural influence of the Turkish and the French to the reason we still use American dollars as currency, there are many factoids that even locals will find surprising. For example, the original rotating rooftop bar was at the Holiday Inn, the almost-40-year-old relic towering behind the Phoenicia Hotel. Home to “the original SKYBAR” as Ronnie put it, the hotel was only operational for one year before the civil war broke out. The tour caters mostly to tourists – I met a Dutch freelance photographer, a few Americans, and two British ladies vacationing here after one had won tickets to stay at Le Gray at an auction in the UK. I found it disconcerting that foreigners seem more heartbroken by our history than our own people. In Samir Kassir’s “Beirut”, Robert Fisk wrote, “I am suspicious of foreigners who tell me they love Beirut. I love the life I live in Beirut, but I think you have to be homegrown – or at least Arab-grown- to claim a city like Beirut as an amour.” It can be argued that those who visit do not have to endure the everyday troubles that residents deal with; they can live in the romantic fairytale and leave before reality strikes. Plus, they probably don’t deal with electricity cuts. Beirut is a self-loathing lover you don’t want to leave because you know she can be beautiful if she just opens her eyes and tries – magical in all her attempts to shine no matter how many times she falls. However, it is still upsetting that foreigners are moved by the story of Martyrs’ Square, a piece of our history that seems to have been neglected. One phrase stuck with me personally during the walk through the ruins of Roman baths located below the Ottoman-built Grand Serail Parliament Palace and literally underneath the French-built bank buildings: “We chose reconstruction over preservation.” We have chosen reconstruction over preservation in the past one too many times, maybe it’s time to preserve our country’s legacy instead of restoring its self-destructive patterns. We should appreciate the contradiction that makes us so dysfunctionally wonderful but we should work to better it because our beautiful country is sinking again, and we can’t continue to blame others for its fate. As unfair as it may be, it is up to us – the youth- to change things. We need to resuscitate and revive the Beirut that is asleep beneath the ruins and damaged exteriors. Complaining may make you feel better about a current situation but that only gives temporary alleviation; making the decision to change is the only solution for improvement. Lebanon, you are so frustrating only because of your wasted potential. I want more for you. You are richer than any nation because you have culture, history, and pride – things that cannot unnaturally emerge from the sands: they flow in the veins of your people and in the waters that wash away layers of destruction every few years. Enough drowning, it’s time to swim.